This illustrated homage to maternal wisdom features a quotation by Harriet Beecher Stowe. Among their many amazing talents, most mothers share their wisdom in a naturally nurturing way. 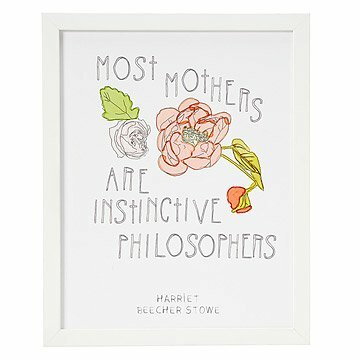 Kimberly Ellen Hall's print pays tribute to maternal wisdom with a quotation from Harriet Beecher Stowe--"Most mothers are instinctive philosophers"--wrapped around a spray of sweetly rendered roses. Ready to hang, the print makes a thoughtful gift for any mother who inspires through her words as well as her deeds. Designed in Philadephia; printed and framed in Portland, Oregon. Meet the illustrator - Kimberly Hall - on the blog! Kimberly began a daily drawing practice to help appreciate the things around her. She is inspired by Maira Kalman's belief that a painting is truer than a photograph, and applies the idea to drawings, as well. Kimberly studied textiles at Central St Martins in London, and has traveled the world while creating prints and patterns in publishing, fashion and art. Read a Q&A with Kimberly.